Sometimes the recipes I post here are completely out of whack with the time of year (although completely in whack with the southern hemisphere, so it’s not a complete bust). I’m probably more guilty of posting summer recipes in winter than the converse. If I could have my druthers, I’d eat summer food in winter. Is that crazy? Don’t get me wrong, I really do love those slow cooked winter stews, soups, and braises. I like to make those in the dead of winter, when temperatures are cold… very cold. Lately it has been feeling like the dead of winter and yet it’s still technically autumn. We’re a little ahead of the curve here in Colorado, I suppose. Time for some food to warm the soul. Last month my friend introduced me to her favorite charity The Women’s Bean Project in Denver, Colorado. It’s so much more than a charity. The Women’s Bean Project is a non-profit organization that tackles the issues of poverty and hunger by empowering women with the skills to be self-sufficient. When I inquired about sending a donation in, I had a lovely email exchange with Diana Lachiondo who offered to send me some of their products to sample. 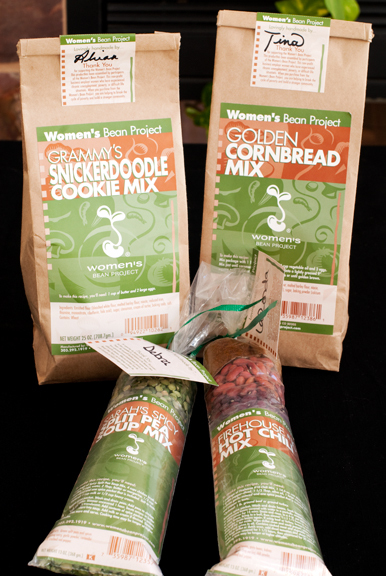 The Women’s Bean Project gives participants entry-level training in their gourmet food business, turning out packages of soup, chili, bread, dip, iced teas, or cookie mixes. (They have jewelry now too – great ideas for holiday gifts.) What I got was a beautifully wrapped gift basket with several packaged mixes, each one signed by the individual who made it. I had chili on my brain and gave it a spin. The packet contained a gorgeous assortment of dried beans and spices. I merely followed the recipe instructions and added the fresh ingredients like ground beef, tomatoes, onions, garlic, peppers. It had a nice kick and received the thumbs up from both Jeremy and myself. Imagine my delight the other day when we were walking through the grocery store in our little mountain town and saw Women’s Bean Project soup mixes on the shelves! Don’t fret if your grocer doesn’t carry their products – you can order online directly from their website for a very good cause. Making chili also demands cornbread. A friend of mine recently asked if I had a cornbread recipe I could recommend. I had plenty of cornbread recipes, but none that knocked my socks off (the socks, they were still on my feet). Even though there was a mix included in my WBP packet, I had been itching to test drive a version I had dog-eared long ago. Baking… baking is always an adventure at high altitude. I slowly wend my way through failures and disappointments before I can stamp a recipe for approval and add it to my lab notebook. I like my cornbread to be relatively moist and the recipe I settled on trying this time around called for yogurt or sour cream. That’s a good sign for moist crumb. I went with plain Greek yogurt because it’s thicker and I generally substitute it for sour cream (which makes my tum hurt). The cornbread came out of the oven with no signs of craters, volcanoes, disembowelment. It looked perfect. Over the years I’ve learned that minor adjustments, particularly in leavening agents, can make all the difference. It was cohesive without sacrificing moisture or that telltale coarse crumb of a good cornbread. A perfect accompaniment to my bowl of chili! I do believe this recipe will go into the lab notebook. It’s a keeper. I must admit that I like to nosh on cornbread with a little honey too. Recently I received a sample of some Organic Royal Sidr Honey from Yemen Sidr Honey because one of my readers suggested they contact me (thanks, reader!). I’m no honey expert, but my good friend, Kitt, is a bee keeping expert. I asked her to check them out and she was impressed and fascinated with their bee keeping operations which are based on traditional methods and do not use chemicals, drugs, or machinery. When I first sampled the raw honey it tasted like… honey. Sometimes I’m no good like that. I ran to my cupboard and did a taste comparison with some store-bought honey I had on hand (Madhava honey). The difference was obvious. The Madhava was strong in flavor and a little fruity. 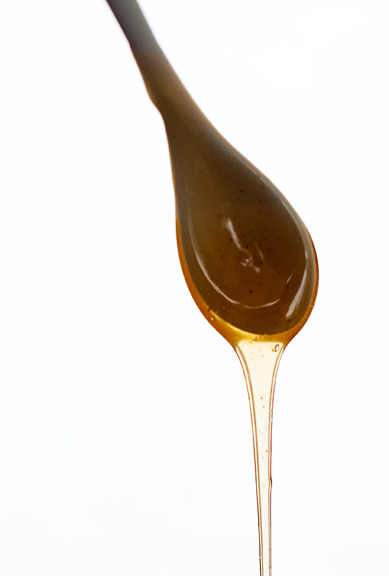 The Sidr honey had a more delicate floral taste that lingered on the tongue, very pleasant and not overpowering. Full disclosure: I received a complimentary gift basket containing a chili mix, cookie mix, cornbread mix, and lentil soup mix from The Women’s Bean Project and a free sample (about 4 ounces) of Royal Sidr honey from Yemen Sdir Honey. Position oven rack in the center of the oven and preheat to 425°F. 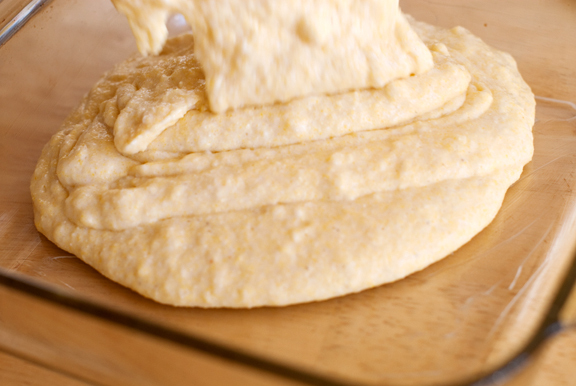 Grease an 8×8-inch square pan with butter or cooking spray and dust with flour. 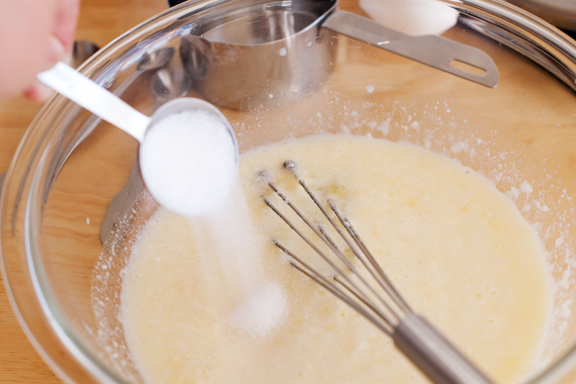 In a large bowl, whisk together the melted butter, egg, milk, yogurt (or sour cream), and sugar. 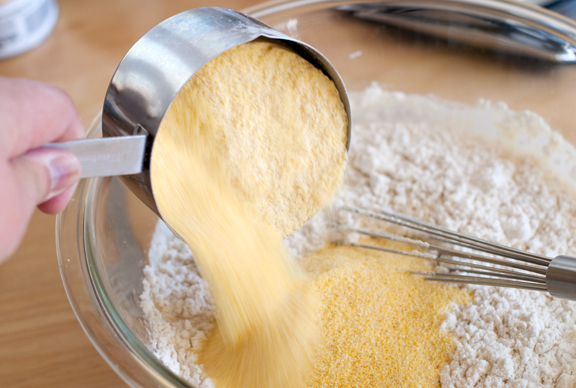 Add the remaining dry ingredients and stir together until just blended. Don’t overmix. Pour the batter into the prepared pan and bake for 20-22 minutes (22 to 25 minutes @8500 ft.) or until the top begins to turn golden and a toothpick inserted in the center comes out clean. Just take care not to overbake or else the cornbread will be too dry. Cool on a wire rack and serve. You might want to change the 14Cup of Sugar to 1/4 C? This cornbread looks really good. I’m going to try it this week. The honey photo is gorgeous by the way. I’ve never baked cornbread before, I always make it on a cast iron skillet. Does it taste different when baked? I love cornbread but don’t make it very often. I’m fascinated adjustments are needed when baking at different altitudes. But I was never much good at science. Oh, lovely! That cornbread looks really good. Fantastic with chili! I love the Women’s Bean Project. You really should try the cornbread mix. It is my favorite item from WBP. I’ve tried almost everything from WBP. Whew…I thought being a Southern girl, sorry…woman, you’d leave the sugar out as one of my friends does. I can’t stand her cornbread. It’s dry & tastes like….um…worse than nothing. Looking forward to trying this one. 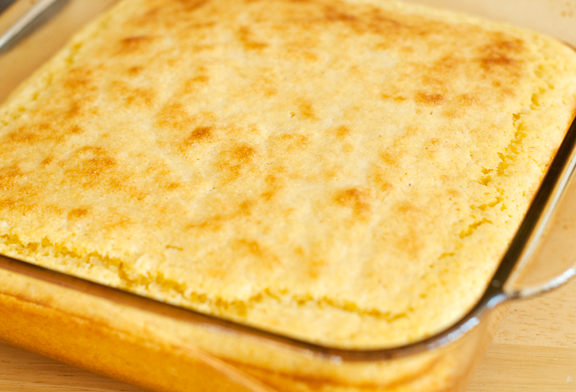 Cornbread is one of my favourite winter foods – it just screams Christmas morning to me. Although I rarely have it any other time of year, I definitely love the stuff =D. Yep, you’re definitely ahead of the curve – we just got a baby dusting of snow last night, and DEAR GOD BATTEN DOWN THE HATCHES we’re supposed to get 5-10″ tomorrow. *sigh* I do love the overreaction of meteorologists, don’t you? And while I have a go-to cornbread recipe (my great grandma’s), yours does sound wonderful! Yum! 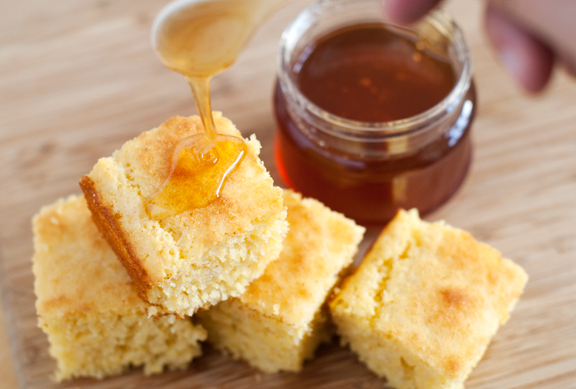 We’ve been making a lot of cornbread around here lately, and drizzling it with honey. I think you put me in the mood to make some more tomorrow :). Hello, Nice post! I am curious about organic honey though. Is that possible with bees? Do you know? Oh, cornbread…that’s what my soup was missing tonight! Good thing there’s leftovers, I think I need some cornbread! I’ve never made it with yogurt, I wonder if that’s the secret to the texture. I must find out! Our local beekeeping store sells honey, at least 10 different kinds (more during the summer). The differences in color and flavor is amazing! My kids and I love to go sample, what I buy depends on the purpose. I don’t think I’ll ever be able to go back to grocery store honey! Hehe. I really think you and I talk quite alike sometimes Jen. Total silliness. 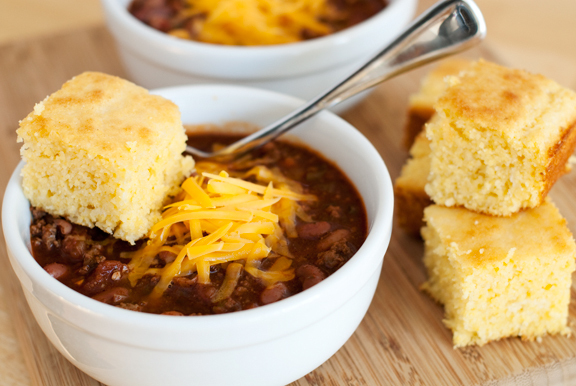 Ok well, I know what I’m making for dinner sometime this week: soup and cornbread sounds just about right (or chili, if I have time)! Gorgeous pictures, as always! I love cornbread and I am bookmarking this RIGHT now. Thanks for posting about the Bean! Glad you enjoyed the soup. 14, 1/4…your recipes are fantastic Jen!!!! I so love every one of them, so are so talented and gifted, may Gd bless you always, he blessed us with your blog!!! altought i’m not a fan of chili, the cornbread *does* look tempting. and that honey ! just gorgeous ! we’ll be getting our first real snowfall up here… we’re awaiting apparently tomorrow between 25 and 35 centimeters of snow, with high winds. haven’t really had much cornbread. I guess my only experience with it comes from Kenny Rogers. I love how you did THAT honey shot! How is it done?? Made this last night to go with our pinto beans and this is now my favorite cornbread recipe! I used sour cream because I’m out of yogurt, but it was moist and perfect. Thanks Jen! Chaitali – I’m not sure. I’ve never tried it in a cast iron skillet (although that does sound good). Kristin – I’ve heard that people in the south don’t like sweet cornbread. I PREFER the sweet kind (not too sweet, but a little sweet is great). Angie G – I think it means that they don’t administer antibiotics or chemicals to the bees and that it’s harvested with minimal intervention. Karen B – yes, I have found most cornbread recipes calling for yogurt or sour cream tend to come out with that lovely moist crumb that I love so much. Melissa – so proud of you for starting to bake! Go girl! Lime butter sends this over the top. Just take room temp butter, add some lime juice and zest, and put it back in the fridge. Warm, fresh-out-of-the-oven cornbread with cold lime butter melting into it – probably the best thing about winter. I was just curious, if I wanted to put these into a muffin sheet instead of an 8×8 pan would that effect the cooking time/temp at all? I bought that Sidr honey from the website http://www.yemensidrhoney.com, and I just received it today. Wow! It has very special taste. I have now all the ingredients to do your cornbread. I am so exited!! Baked this last night with my 5 year old. Not only is it easy to follow (and a special thanks for instructions on placement of the rack in oven), but it is absolutely delicious. Practically polished it off in one sitting as an side with soup, salad and cheeses. Thanks so much for a great recipe. I am curious if we are at the 8500 ft. do you bake with convection on or just regular bake? Is there a rule of thumb. In NJ I always used convection but things get much more dried out here so I am unsure. Jackie – I’ve done both. My oven at home doesn’t have convection, so it’s always traditional baking. Our place in Crested Butte has convection, so I’ve started using it (it reduces the temperature by 25° automatically). I think if you’re worried, then go with conventional until you have it just right, then perhaps try and switch to convection and see how it compares? THANK you for this. We are living at 5,000+ feet now and I am new to high alt baking. This turned out great. We are living in Mexico and the corn “meal” that was available to me was the masa used for tortillas (corn flour). Still, this turned out well — different texture than with the other type of corn meal, but still yummy and rose correctly etc. Thanks!